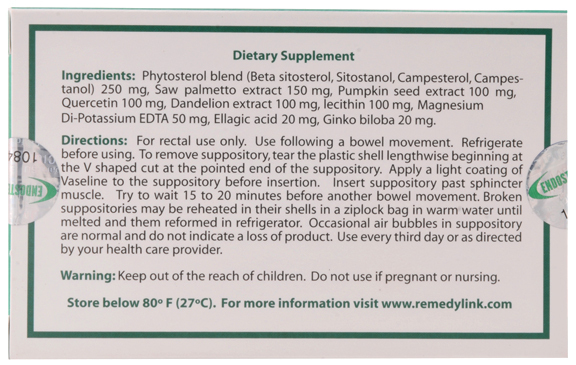 These are the Endosterol ingredients that compromise each Endosterol suppository: Phytosterol blend (Beta sitosterol, Sitostanol, Campesterol, Campestanol) 250mg, Saw palmetto extract 150mg, Pumpkin seed extract 100mg, Quercetin 100mg, Dandelion extract 100mg, Lecithin 100mg, Magnesium Di-Potassium EDTA 50mg, Ellagic Acid 20mg, Ginko Biloba 20mg. Beta sitosterol – Common denominator found in saw palmetto, pygeum africanum, pumpkinseed oil and stinging nettles. Beta-sitosterol is an extremely effective, natural treatment for an enlarged prostate. Sitostanol – Reduces serum cholesterol. i.e, a cholesterol blocker. Campesterol and Campestanol – Inhibit intestinal cholesterol absorption. Quercetin – It is a Flavonoid, which can be used to reduce allergy symptoms, and reduce inflammation associated with arthritis and prostatitis. Quercetin serves as an antioxidant, which neutralizes free radicals throughout the body. Quercetin improves pain and other symptoms in men with chronic inflammation of the prostrate, which is also known as prostatitis. Dandelion – extract It has been used as a medicine for conditions such as fevers, diarrhea, fluid retention, breast problems and liver diseases. Its main use as an ergogenic aid is as a diuretic, to decrease water retention. The leaves contain substantial levels of vitamins A, C, D, and B complex as well as iron, magnesium, zinc, potassium, manganese, copper, chlorine, calcium, boron, and silicon. Lecithin – Is regarded as a surfatant, emulsifier, or lubricant. Non-toxic to humans, and can be metabolized by the body. Magnesium Di-Potassium EDTA – used for suppository chelation. It is safe for adults who may be on a sodium-restricted diet, and for those who use calcium channel blockers, since it is calcium free. It is recommended that all users take a calcium supplement 12 after hours taking Endosterol Prostrate Therapy since Magnesium Di-Potassium EDTA can help mobilize dystrophic calcium from the body soft tissues. Ellagic acid – Contains a naturally occurring phenolic compound that has very strong anti-oxidant properties and is also a potent anti-carcinogen. Naturally found in fruits, it also has antibacterial and antiviral properties.